The Polaris Ranger is the number one choice in the offroad community for a side by side. With a wide variety of engine sizes all available in standard or crew cab, full size or mid size, just about anyone can find a Ranger that suits their needs. WhoMoto is here with a full choice of Polaris Ranger accessories to make sure that your vehicle isn’t just another side by side in the crowd. Whether you’re a hunter, fisher, farmer, or just enjoy some trail riding, we’ve got all the accessories to customize your Polaris Ranger side by side. At WhoMoto.com, you can find a broad list of Polaris Ranger aftermarket accessories such as roofs, windows, lift kits, cab systems, skid plates, storage racks, lighting, radio and speaker systems, gun racks, heaters and more. Browse our catalog and make a custom selection of Polaris UTV accessories that will make your Ranger to stand out in the crowd. Add these handy folding mirrors to your Ranger for greater visibilty while on the road or trail. Add up to a 4000 lb winch to the front of your Ranger for when you stuck in those muddy situations. Add a winch to the front of your Ranger for when your stuck in those muddy situations. Add this 2 inch Hitch Receiver to the front of your mid size Ranger to greatly increase it's capabilities. Add this 2 inch hitch receiver to the front of your full size ranger to mount plows or other accessories. Handy box to add secure storage under the seat. Stop cracked floorboards with our aluminum panels. 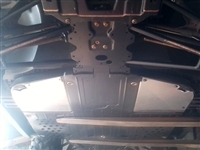 These Ranger are pre-drilled and use the existing screws that are already or your Ranger to mount. 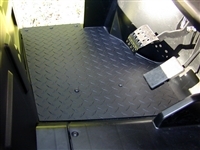 Add protection and style to your mid size standard cab Polaris Ranger with these 1/8 inch diamond plate floorboards. This rack allows you to mount up to two guns over head in your 2015+ Polaris Ranger 570 Mid Size. Use these dirt stoppers to make cleaning up after a long day of riding significantly easier while also preventing debris from damaging valuable components. Give your 800 full size Ranger extra ground clearance or allow mounting for larger tires. Prevent sticks and stones from breaking or coming through your floorboards. Replace your stock plastic skid plate with this heavy duty 3/16 inch thick aluminum. Add footwell protection and help to keep the plastic on the edge of your Ranger from being damaged.